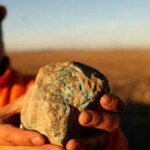 There could be a lot more of the outstanding Mongolian Turquoise to come out of Mongolia. Rio Tinto Mining and the Mongolian government recently closed a deal to actively produce the Turquoise Hill Mine in Mongolia. For all of us in the Turquoise world, we hope that this will mean more of the gorgeous water web blue Mongolian Turquoise! If you have never seen Mongolian Turquoise you probably do not know that it is some of the most beautiful natural Turquoise in the world. This Turquoise has been coming out of the mines in a beautiful blue with water web matrix or spider web matrix. Mongolian Turquoise is relatively new to the western market, but has a long history in Asia. KHANBOGD-SOUTH GOBI DESERT, MONGOLIA – OCTOBER 8: Mongolian herders live near the OyuTolgoi mine October 8, 2012 in the south Gobi desert, Khanbogd region, Mongolia. The Oyu Tolgoi (Mongolian for Turquoise Hill) copper and gold mine is a combined open pit and underground mining project. The site, discovered in 2001, is located approximately 550 km south of the Mongolian capital, Ulan-Batar in the South Gobi Desert. Turquoise Hill Resources (Formerly Ivanhoe Mines) and Rio Tinto signed a long-term comprehensive investment agreement with the Government of Mongolia in 2009 with the deal awarding Turquoise Hill Resources, whose majority shareholder is Rio Tinto, with a controlling 66 percent interest and The Mongolian Government with a 34 percent interest in the project. Rio Tinto provided a comprehensive financing package and assumed direct management of the project under an agreement with Ivanhoe Mines. Initial production from open pit mining is currently underway and commercial production is planned to start in first half of 2013. An 85million USD investment was earmarked for education and training projects, with Mongolians expected to constitute 90 percent of the work force when production begins in 2013. When Oyu Tolgoi starts fully operating Mongolia will be set to become one of the world’s top copper and gold producers with production estimates of 450,000 tons of copper and 330,000 ounces of gold annually. Mongolia is currently the world’s fastest growing economy with its GDP increasing by more than 17 percent last year and an estimated $1.3 trillion in untapped mineral resources. Oyu Tolgoi (the Turquoise Hill Mine) is Mongolia’s largest foreign investment project and the country’s biggest economic undertaking to date, which is projected to add one-third of future value to the country’s GDP by 2020. Mongolian Turquoise has undoubtable been sold over the years as many other brands of Turquoise. Many people mistake it for Tibetan Turquoise or Chinese Turquoise. Mongolian Turquoise has also been falsly sold as Morenci Turquoise, Kingman Turquoise and Turquoise from various spiderweb Turquoise mines in Nevada. This is sad, Mongolian Turquoise is far to fine to be sold as anything else. Anyone should be proud to own Mongolian Turquoise or Mongolian Turquoise Jewelry. Hopefully the opening of the Turquoise Hill mine will lead to large discoveries of fabulous natural Turquoise and will raise awareness of this gorgeous Turquoise. Thank you for reading this great news on Mongolian Turquoise.